Virtually all development organizations need access to remote public resources such as JCenter, NuGet Gallery, npmjs.org, Docker Hub etc., to download dependencies needed for a build. One of the big benefits of using Artifactory is its remote repositories which proxy these remote resources and cache artifacts that are downloaded. This way, once any developer or CI server that has requested an artifact for the first time, it is cached and directly available from the remote repository in Artifactory on the internal network. This is the usual way to work with remote resources through Artifactory. There are, however, organizations such as financial institutions and military installations, that have stricter security requirements in which such as setup, exposing their operations to the internet, is forbidden. To accommodate these use cases, we recommend a setup with at least two Artifactory instances; one on the DMZ and another on the internal network, a setup commonly known as an air gap. In this scenario, the two Artifactory instances have no network connection between them. To get dependencies from the internet, the external instance has to download them, export them to an external device (such as a hard drive or USB flash drive), and then the internal instance has to import them for use by the developers and CI servers. Strip down your code, leaving only the dependencies declaration. Install the stripped-down code on a virtual machine on the DMZ which has the tools needed to run it (for example, if you’re developing npm packages, you would need the npm client installed on the DMZ machine). The corresponding client requests the dependencies you need through Artifactory which recursively downloads them, as well as any nth level dependencies that they need too. Here are two ways you could export new dependencies (i.e. those downloaded since the last time you ran an export) and then import them to the internal folder. [Info:] Downloaded 2 artifacts from Artifactory. And since JFrog CLI uses checksum deploy (similar to the case of downloading), binaries that already exist at the target in the internal instance will not be deployed. The output below shows that only one new file is checksum deployed, apex-0.3.4.tar. [Info:] Uploaded 3 artifacts to Artifactory. Now we just upload the contents of NewFolder to the internal instance like we did before. A remote repository in Artifactory is one that proxies a remote resource (such as a public repository on the internet like JCenter). A smart remote repository is one in which the remote resource is actually a repository in another Artifactory instance. The virtual repository of the external instance tries to provide the requested dependency from one of its aggregated local repositories, or from its remote repository cache. If the dependency can’t be found, then the remote repository downloads it from the remote resource, from which it can then be provisioned back to the internal instance that requested it. There’s a small setting you need to remember. 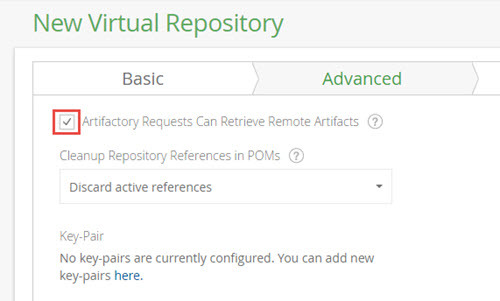 The virtual repository on your internal instance must have the Artifactory Requests Can Retrieve Remote Artifacts checkbox set. In this method, you download dependencies to the external Artifactory instance (in the DMZ) using either of the methods described above. Now all you have to do is create a remote repository in your internal instance and configure to invoke a pull replication from the “clean” repository in your external instance according to a cron job to pull in all those whitelisted dependencies to the internal instance. If you are using JFrog Xray with your internal Artifactory instance, then you face a similar problem. In order to scan your indexed artifacts, it must ingest data on issues and vulnerabilities from the various feeds it is connected to. The primary feed comes from the global database server maintained by JFrog, and you need an internet connection to synchronize with it periodically to download new data. When you have a live internet connection, the database is synchronized automatically, however without an internet connection, you have to go through a manual process similar to the one described above for dependencies using offline mode. Basically, you download the Xray database update using JFrog CLI on your external instance in the DMZ (Xray will generate the required command for you), copy the downloaded files to the internal Xray server, and then do a local update. Organizations that have to work off the grid, pay a price to maintain their enclosed, secure environments that are disconnected from the internet, but that doesn’t mean they can’t use leading tools that are available on the market. With a bit of tooling and scripting, and maybe some manual interaction, they can use an air gap to access JFrog Artifactory (and JFrog Xray) to get a nearly-online experience while maintaining their strict security policies in their development environments.